Perpetual motion machines are a thing of fantasy/delusion, but there’s a lot of energy floating around that doesn’t cost anything to harvest. The calculator and weather station shown here run off of microwaves from that TV tower in the distance. 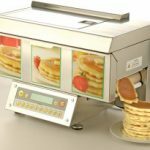 Have we gotten so lazy that we need a Pancake Machine? !